We cobbled together our air-mile points. We collected our Citi-rewards and bought Marriott cards. We got our party clothes together. I took up needlepoint and made a gift! And then we traveled to Chicago to celebrate with the Buxoms. It was their 25th wedding anniversary and they hired a ballroom for their nearest (and farthest) and dearest. K and I and their family and friends celebrated in the most stunning club in the city. There was a 16-piece orchestra which played dance music from the 40's, 50's and 60's. The conductor was a delight to watch and listen to. We danced, we ate wonderful food...it felt like it was everybody's anniversary. It was a beautiful party for a wonderful couple. And what did I bring them? 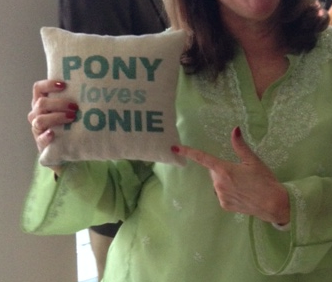 A pillow I needlepointed of their pet-names. Poppy loved it, which made me very happy. It was a night to remember - romantic and chic, truly divine. 'It felt like it was everybody's anniversary' ~ what a lovely description! Sounds like it was a wonderful celebration. Just brilliant! I need those spats. What a great celebration for all of you! What a celebration! Clearly the Buxoms know how to party. What a sweet present you made for them! I would expect nothing less from the Buxoms. It looks divine! And I am shocked by your crafting. What a wonderful gift. And such a stylish, joyous occasion. Wow! I'm glad you and K were among the dearest/farthest who were included. How divine and very fancy. Most pleasing.